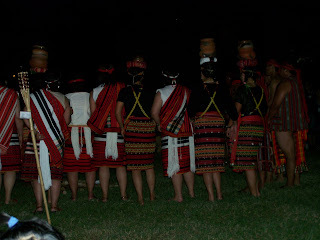 On the eve of July 26th, the BIBAK Northeast women donned their colorful gateng/tapis (skirts) and the men tightly worn their wanes (g-strings). 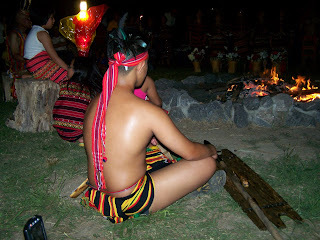 The night was humid and the heat intensified as we gathered around the fire just as our ancestors did a long time ago. The men sounded the gongs to a synchronized steady beat, just like the heartbeat of every brave Igorot, and the beautiful women raised their hands, as if giving thanks to the heavens or imitating a free bird in flight. As the gongs got louder and the fire burned brightly, I was instantly transported to a different world. I was no longer in Virginia; I was home. This was the second time I've attended the BIBAK NE Grand Canao, and it was a grand op portunity to meet so many people. It was such a relief that I can call anyone auntie and uncle. Although my Kankanaey is rusty, Mom patiently translated the conversations and songs for me. The celebration persisted through the night as different ethnic dances (Balangbang, Tadok, Banga etc.) and songs took the stage. There was a group who wore cowboy hats/boots and performed a country dance, and another group integrated a Broadway like show in their full gateng/tapis regalia. 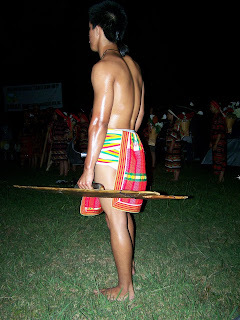 I'd actually prefer to watch more authentic Igorot dances rather than a country line dance. I see such dances all the time, and for me, seeing Igorot dances is such a rare and wonderful treat; that's just my opinion. As you can see, the photos are a bit dark because some performances took place on an open ground with just a campfire for lighting. It was tough to take photos without tripping on something. I tripped and laughed at myself a couple of times, but it was too dark for anyone to notice. To those unfamiliar with the different colors that the tapis/gateng represent, each color combination woven through the tapis belong to a group or tribe. (For those who are more familiar with this topic, I do need your help about the color combinations.) Grand Canao 2008 was truly a festival of colors. That night, tribal identity or divisions no longer existed, as the different colors danced unified to one rhythm - the beating of the gongs. PS: Aside from the usual Filipino dishes, there was a huge pot of Pinikpikan (if you want to know what a Pinikpikan is let me know) on the side. I got a full bowl and ate it with gusto. After finishing my plate, I wondered where was the Etag (cured meat or I prefer to call ham) because I couldn't find one in my bowl. The aunties and uncles laughed. wow, how wonderful to have a sense of home even when one is far away, huh? have a great week! oh, sounds wonderful to me! it's amazing how a festival like that gets organized in a totally different place. witsandnuts, it was a wonderful experience, and i'm hoping we get to do more this type of social gathering. layrayski, we are so lucky that we can still experience all these even if we live in a different country and time. now the the gathering is over, i am starting to have flashbacks and tremendously miss the Philippines. anna, i definitely felt at home during the gathering. if i could extend it to a week, i would =). you have a wonderful week as well. ms firefly, i feel at home too when i meet Filipinos here in MD and DC. the tongue misses it's native language i suppose. Hi Kero, Canao was held at Williamsburg, Virginia (inside a US base). I'm sure Mng. Caesar misses these events. I do remember that they performed an Ifugao dance, but I couldn't remember the name. Yes, I heard about Ate Maya's trip. I hope she gets settled there well. Please give Mng. Caesar, Mng. Maya, Sweet Andreas all my love and hugs. Of course, tight hugs to you as well. mega-cool! ang galing nyo to have preserved your culture like that. during the last philippine festival in japan, we also had performances for the cordillerans in tokyo. it was great! even members of the audience joined in. really interactive! hi caryn, yes, we do try to preserve the cordilleran culture. it is important that our children know what rich culture they came from even if they were born in a different country. good to see your here. i'll be visiting your blog soon. Wow. Thanks for sharing. Makes me want to go look for a live chicken to make pinikpikan. Too bad I cooked all the etag I brought from Sagada. admin, i was wondering who 'admin' is. can you actually pack and carry etag on the plane? next time you do, i want some, please. hmmm pinikpikan .. you are right it cannot get closer to home than that. i wonder how many people were there all in all for an event like that to be organized. toni, there were about 150 families there. a lot of them brought their tents and camped on the base. i did not expect the pinikpikan there, but i jumped for joy when i saw it.